Iconic moment, Eritrean sanction lift Iconic moment, Eritrean sanction lift – (Addis) Fortune – The Largest English Weekly in Ethiopia! A rare but iconic photo. Taye Asqe-Sellasie, Ethiopia's Permanent Representative in the United Nations, voted in favour of lifting sanctions imposed on Eritrea. Members of the Security Council voted - unanimously- to lift the sanctions imposed for nearly a decade. A rare but iconic photo. Taye Asqe-Sellasie, Ethiopia's Permanent Representative in the United Nations, voted in favour of lifting sanctions imposed on Eritrea. Members of the Security Council voted - unanimously- to lift the sanctions imposed for nearly a decade. Introduced by Djibouti, it was in 2009 that the UN Security Council imposed embargo on arms and introduced tough and targeted sanctions to punlish Eritrea's alleged support to al-Shabab in Somalia. 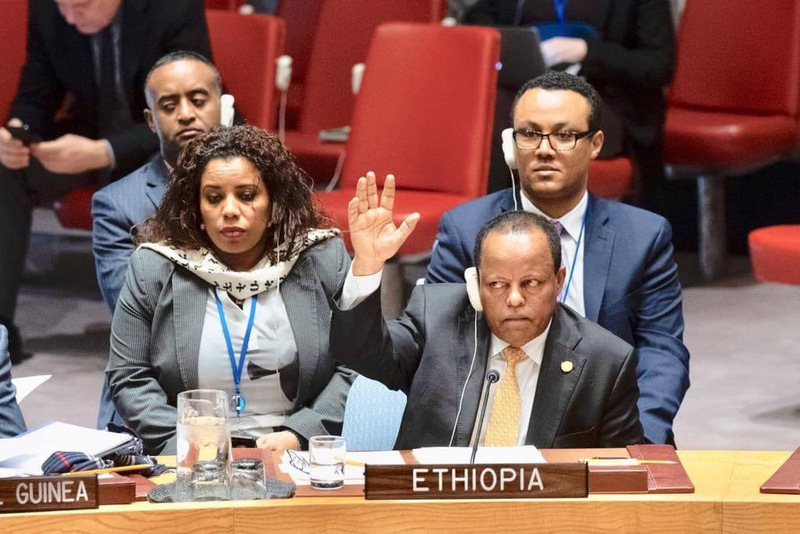 Ethiopia is very pleased with the lifting of the UN sanction believing that, "it will further enhance the collaborative gains that have been achieved in the region over the past few months," according to a press statement issued from the Prime Minister Office following the announcement. Although welcomed the lifting, Djibouti remains to have some reservations. Its Ambassador to the UN, Siad Doualeh, said "third-party mediation failed to make significant progress toward a settlement" on the border dispute his country has with Eritrea. "Continued stalemate is not an option," he was quoted as saying by the Associated Press.